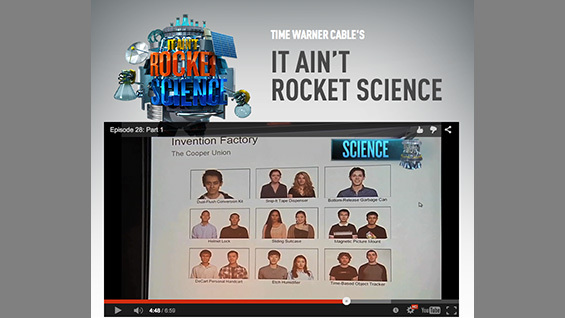 The Invention Factory, a six-week intensive summer program where Cooper students must conceive, design and build a potentially-patentable invention, has been featured on Time Warner Cable's broadcast and online series It Ain't Rocket Science. The cable series focuses on education in the science, technology, engineering and math fields. The series has previously featured the annual middle school outreach program organized by students of the Albert Nerken School of Engineering. Participants in the 2014 Invention Factory appear on camera, including students Eric Nguyen, Jessica Gabriella Marshall and Professor Alan Wolf, co-founder of the program. "It's rewarding seeing all of your work come into fruition, not because of a number or a test score," Eric Nguyen says. The piece reveals that last year's participating students will be pitching their inventions to representatives of Quirky.com, an invention facilitator, in March.